The Irish coffee recipe was invented in the 1940s and has been popular ever since. 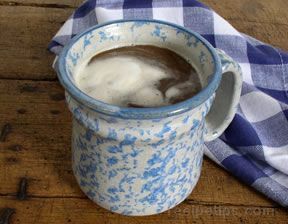 There are several variations of this St. Patrick's Day beverage, but all recipes must contain Irish whiskey and, of course, brewed coffee to be considered true Irish coffee. Pour hot coffee into coffee mug until it is approximately ¾ full. Add brown sugar and stir until the sugar has completely dissolved. Top with heavy cream by pouring it slowly over the back of a spoon.